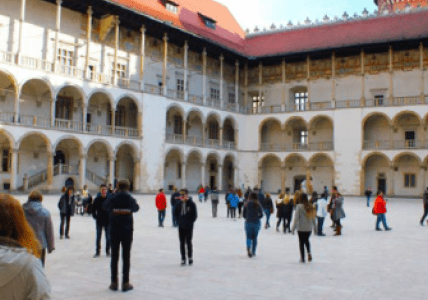 Mark Charman and his students recount their memories as Shebbear College travelled to Poland to discover the historic city of Kraków and its surrounding districts. 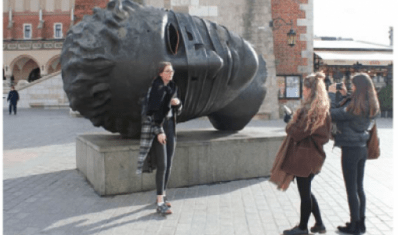 Find out how the trip allowed students to experience first-hand sites they had previously read about in a textbook and the hearty local cuisine they could only dream of. Day 1: Goodbye British rain, hello beautiful Poland! Despite the terrible British weather and local flooding, everyone managed to make it to the college for the 2am departure. We had a good flight from Bristol to John Paul II International Airport Kraków–Balice, just outside the city where we were met by our guide Paulina. Arriving at the Hotel Batory, we enjoyed lunch in the hotel’s restaurant. After lunch we walked for miles, first taking in the beautiful Main Square in Kraków’s Old Town. Still the largest main square in Europe, it is a vibrant scene with street performers, mime artists, musicians, shops and market stalls. During the afternoon we visited the historic district of Kazimierz. Since its inception in the fourteenth century to the early nineteenth century, Kazimierz was an independent royal city of the Crown of the Polish Kingdom separated by a branch of the Vistula River. 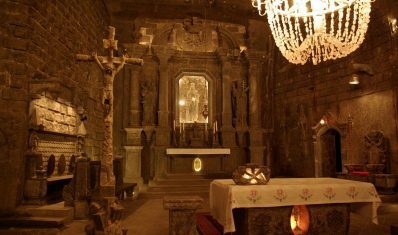 For many centuries, Kazimierz was a place of coexistence of Christian and Jewish cultures. We saw numerous locations where Schindler’s List was filmed and visited the oldest synagogue in Poland, where all the men had to wear a kippah (skullcap worn by all Orthodox Jewish men). After tracing the steps of the relocated Jews out of the city and across the Vistula River, we visited the site of the Jewish ghetto in the Podgórze district. We stood in the main ghetto square where just over 70 years ago the Jewish community were forcibly removed and transported to concentration camps of Belzec, Plaszów and Auschwitz. The ghetto square now contains a poignant memorial to the victims comprising of 70 oversized bronze chairs. The meaning of the memorial has been left open to interpretation; perhaps representing the furniture that was brought there by the Jews, unaware that they were heading towards certain death. The chairs may also represent the Jewish children who carried their own school chairs into the ghetto. A few steps away is Oskar Schindler’s Enamel Factory where we had a tour of the museum, which detailed the effect of World War II and Nazi occupation on the Polish people. After a short rest at the hotel we walked back into the centre of Kraków where we all enjoyed a traditional home-cooked three course Polish meal at Polskie Smaki Restaurant. It was here where we also surprised Lydia by singing ‘happy birthday’ as the waitresses brought out a birthday cake big enough to feed us all. 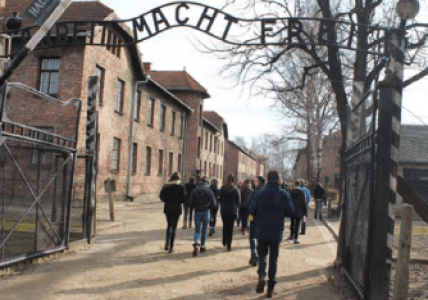 The tours around both camps of Auschwitz I and Birkenau (Auschwitz II) were very moving, uncovering the true enormity of the crimes. The Polish authorities have kept the camps much as they were at the time of liberation by the Russian army. The atmosphere is quiet, respectful and reflective. There are many moving exhibits within the barracks which track the fate of the prisoners held in the camps. Although the vast majority of victims were Jews from all over Europe, the Nazis also imprisoned and persecuted Polish political prisoners and intelligentsia, Russians, gypsies, homosexuals and Jehovah’s Witnesses, among other groups. Rooms full of victims’ belongings, such as suitcases, glasses, shoes, clothing and pots and pans, are a stark reminder of the millions of personal tragedies. Perhaps the most challenging part was confronting 2000kg of human hair (from around 30,000 women) shaved off after their murder. As a mark of respect photographs are not permitted in this room. During our tour we visited the infamous Block 11 where fake trials, torture, punishments and executions took place. We also walked through the first gas chamber and crematorium, which remains intact. We were privileged to be allowed to observe a one minute silence for all the victims on behalf of Shebbear College. This took place at the memorial between the two destroyed gas chambers at the end of the railway track in Birkenau. 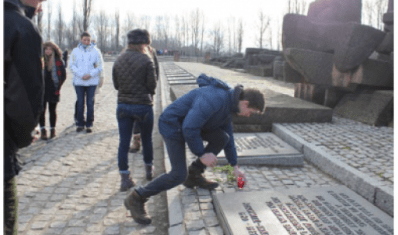 We were all emotional as twins Olivia and Mathew, along with Ross and Bella, ended the silence by placing two red roses and two candles on the memorial just a short distance from where millions perished and where Dr Mengele performed his horrific experiments on twins. All the pupils without exception conducted themselves with dignity and the utmost respect during the four hour visit. In glorious sunshine we headed to the Jagiellonian University where we had a guided tour of the museum and university rooms, including the room of philosopher Nicolaus Copernicus with his scientific equipment still in place. We also entered the lecture room where Pope John Paul II once studied. Next we walked to Wawel Royal Castle and Palace overlooking the Vistula River. We saw the original Royal state rooms of the Polish kings and queens decorated with enormous Flemish wall tapestries recounting Biblical events. ‘Going to Poland was one of the best experiences of my life so far! A very well organised trip, full of adventure, entertainment and education … I wish I had applied to the Jagiellonian University now! Mr and Mrs Charman, Mr and Mrs Bee and Mrs Blundell made sure the trip was well organised and that everyone was happy and healthy, even during our harrowing visit to Auschwitz and the Birkenau camp, the most moving trip I’m sure most of us had ever been on. Poland was a great cultural education in many ways. 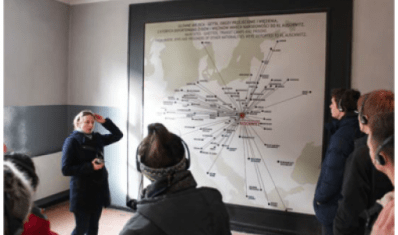 We visited Nowa Huta, a ‘Communist Paradise’ and learnt what the Cold War truly meant on the continent, as well as our exploration of the city of Kraków, eating traditional Polish food and dancing traditional Polish dances. 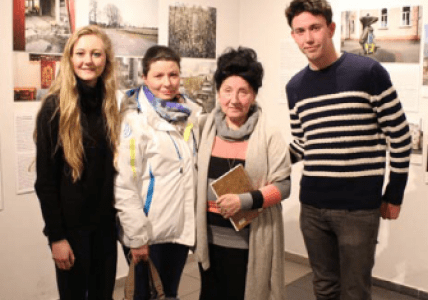 Later that afternoon, we met holocaust survivor Monika Goldwasser in a private conference room at the Galacia Jewish Museum. 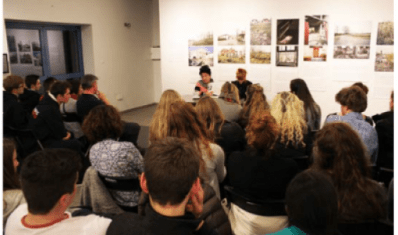 The room was silent as, through an interpreter, she told her heart-breaking story about how her parents were executed by the Nazis when she was just two years old. Although the Nazis had a list of all Jews living in her village, her mother saved her life by wrapping up a doll and carrying it with her to the meeting point. The Nazis didn’t notice the doll and assumed it was Monika. This was an incredible act of courage on behalf of her parents as they would have known they would never see her again. It wasn’t until much later in her life that Monika learned that her parents, along with other villagers, were forced to dig a pit in the local woods before being shot and buried in a mass grave. Monika survived in a Kraków orphanage protected by nuns, despite numerous investigations by Nazi soldiers, until she was adopted by a Polish couple. Once again, there were a few quiet tears as we listened. Ella read aloud a moving poem written by Monika’s father before the pupils asked her numerous searching questions. A short tram ride took us back to the Main Square where we had time for some gift and souvenir shopping in the beautiful Sukiennice – the impressive building in the centre of the square – before heading to the Morskie Oko Restaurant. Morskie Oko Restaurant in the centre of Kraków is built in the traditional style of a highlander’s wooden lodge from the Tatra Mountains region, south of the city. A delicious three course meal was accompanied by rousing Polish mountain folk music. Traditional dancers soon had everyone up on the floor for some very noisy and energetic dancing! Despite walking many miles and experiencing a rollercoaster of emotions, the excellent behaviour and respect shown by all the pupils in some challenging situations is a credit to their parents and the College. In the first of two excursions our guide Ania took us to Nowa Huta. This large suburb of Kraków was designed and built from scratch post-war following Stalin’s communist ideology. Huge buildings inspired by Leonardo da Vinci and in Baroque style housed workers from the Vladimir Lenin Steelworks. We learned about the Cold War, Lech Wałesa, solidarity and the fall of Communism. We were told how the post-war communists were still concerned about potential attacks from The West and were shown evidence of this in the architecture. At the top of the buildings sat gun placements while vast underground bunkers were also built with traditional methods of warfare as well as a nuclear attack in mind. Stalin’s ideology prevented churches from being built in Nowa Huta, but the deeply religious Polish workers fought to build a church of their own; one of the first victories for the workers. We visited the impressive Kościół Arka Pana (The Lord’s Ark), designed with the appearance of Noah’s Ark coming to rest on the roof. This vast church was built for free by volunteer workers with no assistance from the communist authorities. We went inside to find thousands attending mass on the first day of Lent. The pupils were silent and very respectful. Next we headed back to Kraków Main Square for lunch, shopping and a city game, solving clues around various historic venues. In the afternoon we went to the Wieliczka Salt Mine. We saw the most beautiful statues and wall carvings that miners had created over the centuries. Most stunning was a huge chapel carved and decorated completely out of salt. We ascended 1200m in 40 seconds in small lifts used by the miners. To settle some nerves the school song was sung at full volume as we ascended. We stepped out of the salt mines to find everything white and a heavy flurry of snow led to great excitement and a fairly vigorous snowball fight. Then in the evening, by popular request, we walked through the snow to the Galeria Krakowska for a meal and another round of retail therapy. This trip provided a wonderful, thought-provoking experience which I’m sure will stay with all of us for a long time. With much support the trip was a huge success. A special educational tour, it’s not only the wonderful gifts which we will treasure, but the many memories. 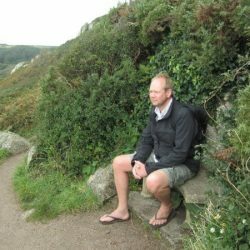 Supporting the staff and students at Shebbear College, Mark Charman is committed to ensuring students maximise their learning experience outside the classroom. Working in collaboration with other staff, Mark and the team led Shebbear College on their trip to support learning and personal development.